State of the Map 2009, was probably the best conference I’ve been to all year. Full of energy, excitement, new things and drive, it felt like a BarCamp should do – one where all the conference goers contribute and give! Yes, I got a bit emotional at the third OpenStreetMap conference, held in the CCC, Amsterdam last weekend – mainly because this globe we are on is the only one we know – we really are mapping our universe, doing it our way. Creating the world we want to live in. I thought it worth while to say “Thanks” to some people. Being British, the feeling of being a bit foolish stopped me from being too effusive! Presented about Open Historical Map, as Shekhar and Schuyler couldn’t make it – which, given that my laptop was broken and I couldn’t take it with me to write it went okay. Thanks to Chris and John for letting me use their computers. 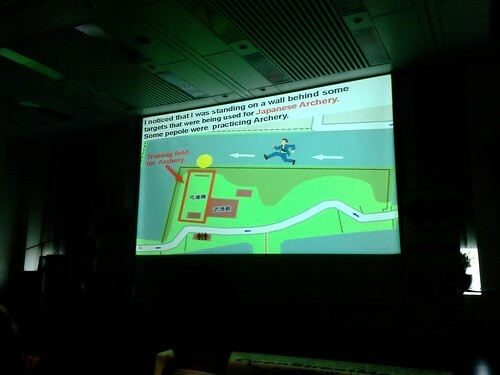 You can get the slides to open historical map on SlideShare, and the video at Vimeo later. Whilst the presentation didn’t shine much amongst a lot of other much beter sessions, it was placed within a good theme about history and temporal issues – a lot of people are thinking about these things now. Repeating what I talked about at Wherecamp 2009 in May, Frankie Roberto showed us that mapping the past (buildings) is not easy – an object may have a start and and end_date, but is it always the same object. What happens when just the facade remains? If half of the building changes land use, if the building changes name? It’s a tricky subject! At the very least we can start mapping now to record changes later. On a walk over and beside canals, I chatted to Andrew Larcombe, also keen on solving these problems – he gives the example of “So you map the Twin Towers… then the next year, what do you do? Just delete them from the database?”. 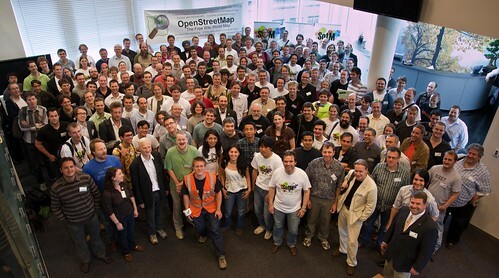 OpenStreetMap is gradually looking from collecting and representing Now, to storing Then, both in the Past for the Future. (If that makes sense!). 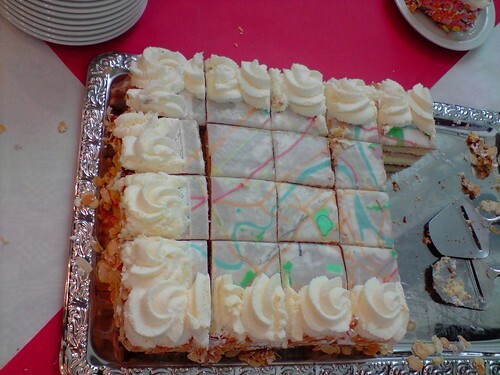 Andrew also talked about a geo-philosophical problem with tracing over old maps. Maps were made with a view of reality – not everything was recorded. And these views change over time. Recording changes over time by using different base maps therefore, may reveal less detail. We hope to form a little group to start working through these issues. Peter Batty: Navteq 18M km roads. OSM 24M km. Peter Stoner, Peter Miller Traveline & ITO – Lovely PDF bus stop maps. OSM teaches them about their own stuff. James Rutter. Inertia in mapping in UK. Michal Migurski – Walking Papers. Plus a UNSDIT form? Nick Black, Editors for vertical. i.e. an editor just for skiiers. Geocommons releasing their geocoder. V. Cool. 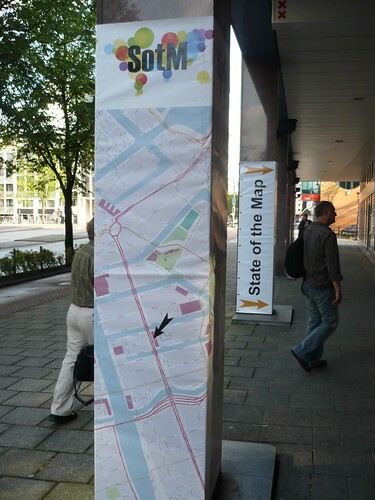 Conflux festival – map warper as tool for art. Motivations of OSMers. Values, fun, exercies, ideology. similar to wikipedia. Gary Gale – Yahoo going open source for place data for 2010. Lulu Accessiblilty – map ramps, features. Also tactile maps! Cartagen & general Jeffery Warren stuff, nav by stars, sun. R. Soden – AFRICOVER africa imports. data silos bad. OSM maps organisations more effective. Italy – mapped Pompeii, better than anywhere else. This entry was posted in geo, Mapping, openstreetmap and tagged cartagen, openstreetmap, osm, sotm, sotm09. Bookmark the permalink.